Today is an unusual tour, visiting some fascinating sites in extremely remote and difficult to get to areas in the forested hills of the eastern part of Aichi. You will need hiking boots or good walking shoes, a flashlight (we can lend you one), rain gear and drinking water. A reasonable level of physical fitness is required for this tour. Our first stop is Shibata Shuzou – an excellent sake brewery more than 200 years old, and a consistent gold medalist in the national competitions each year. The location of the brewery is about 400 meters (about 1300 feet) above sea level. The cooler altitude and shade from the surrounding hills, plus the very pure water of the Shibata wells, enable the brewing of some of Japan’s finest sake. 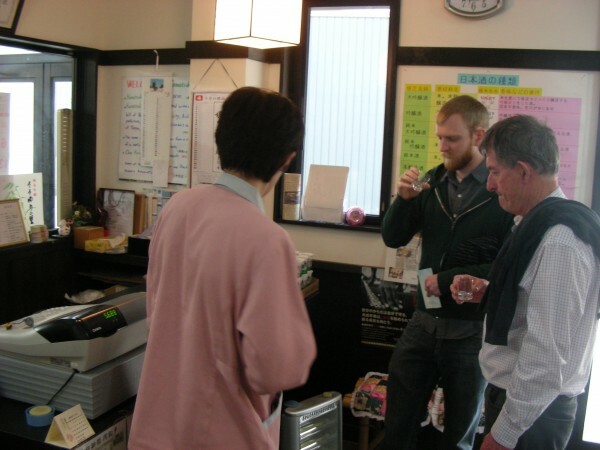 We can tour the old brewery, do taste testing and you can buy some excellent sake as a souvenir. 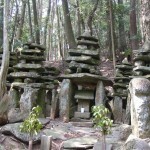 Ancient graves of the Honma family. We next visit kiriyama-no-oosugi and terano-no-ookusu. These are absolutely massive and mysterious ancient trees. Both are revered, are more than 1000 years old, and need to be seen by anyone venturing into these valleys. 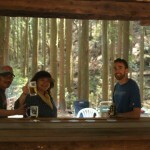 We next visit Hakusan shrine in Sakuraijichou, before entering the hidden valley of Kirikoshichou. Part of Okazaki, this almost totally abandoned valley once contained a thriving agricultural community, probably numbering about 800-1000 people, evidenced by the hundreds of stone retaining walls and abandoned farmhouses. 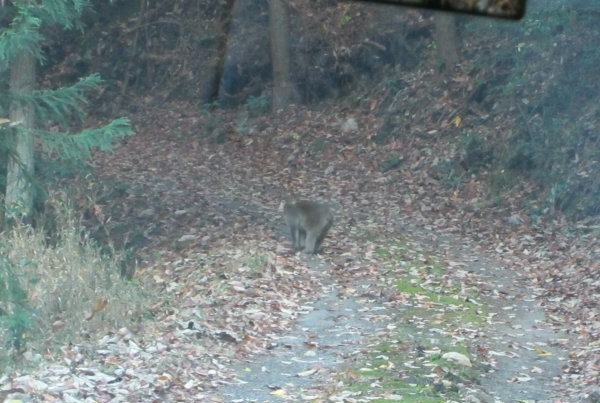 These days only 3 of the houses are occupied, and Japan’s monkeys and serow have the best claim to occupancy. It is however a spectacularly beautiful place. Our destination here is the ancient Susanoo Jinja, a shrine with massive hinoki (cypress) trees, the kirikoshi-no-meoto hinoki. These two great trees tower over the shrine, and form the torii. 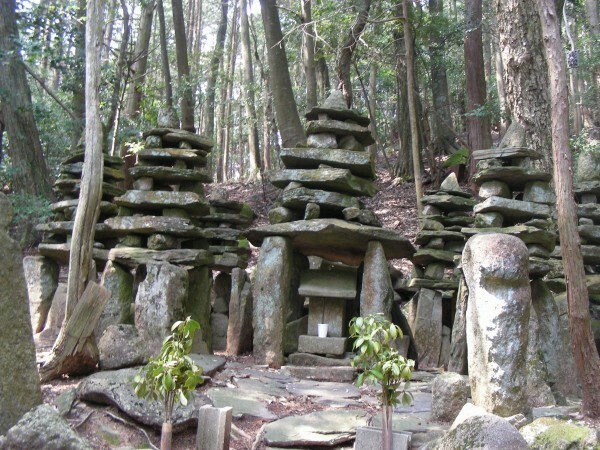 As part of our Indiana Jones routine, we will also hike to the 8 faced gravestones of the Honma family (descendants of the Heike clan, the graves date from the early Kamakura period). Lunch today is fantastic, and is included in the tour fee. Deep in the forest, surrounded by flowing streams we will be visiting ALC friends who have built a fantastic campsite, complete with tree houses, a great BBQ, even a pizza oven. 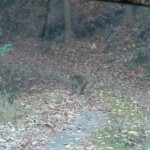 It isn’t unusual to see deer, monkeys and other wildlife. 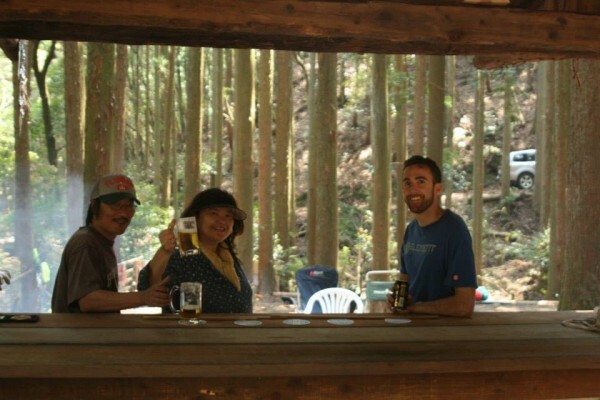 You can relax at the small outdoor bar, or go for a short hike along one of the ancient mountain roads (tracks) that connect each of these valleys. During the sengoku jidai, armies of samurai and ashigaru patrolled the steep mountain passes and frontiers. In happier times, these roads were used for trade and exchange (miso, horses, salt, brides, news). The mountains are largely depopulated now, but everywhere you go you will encounter small shrines, jizo statues and other reminders of a rich history. Our final destination today is Natsuyama Hachimangu, in the neighboring valley. An ancient shrine, said to have been dedicated in the year 531. A fire festival has been held each year since the Kamakura period, and the shrine is a good example of the constant renewal that takes place in Japan, with part of the main structure recently reconstructed to the original design. Click here to apply (opens new window).